While it is considered to be a little small than the other Indonesia’s volcanoes, Mount Bromo is for sure the one that we shouldn’t miss due to its magnificent view and dramatic landscape. It is not the tallest or biggest mountains around, but there is no doubt that it is one of the most stunning ones. While tour sunrise Penanjakan Bromo is super famous among visitors of Mount Bromo, there is actually another stunning location around the mountain that you shouldn’t miss. It is the Sea of Sands that offers such dramatic view for every visitor. It’s no doubt that witnessing the beautiful sunrise will be on top of the list when you come to Mount Bromo. After you are satisfied on the spectacular sunrise view, move your body to the Bromo’s Sea of Sands and do some of these fun things below. The desert-like sand sea around the mountain just offers you another adventure. You can enjoy getting on jeeps and cross the difficult terrain around this mountain. It will be such an exciting off-road jeep adventure for you who love a challenge. There will be many operators who will happily organize an off-road tour for you. So, all you need to do is to get ready and get prepared for such exceptional sensation. 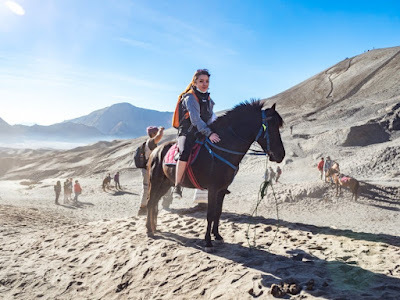 Another great way to enjoy the Sea of Sands of Mount Bromo is by riding a horse. One thing for sure, you don’t have to be scared even it is your very first time to ride on a horse. This is because the horses here are usually held by their owners at the guide rope. So, jump on the horse confidently and enjoy your riding through the tranquility of the Bromo’s Sea of Sands. It will be such amazing experience and it can be a perfect one for your getaway from the hustle bustle of the modern daily life. What is more enjoyable than sipping a cup of hot coffee after such tiring, yet wonderful journey? Once you get to the Sea of Sands, you can find a nearby spot to steam and enjoy a cup of coffee. Here, you will be able to get immersed in the spectacular beauty offered by Mount Bromo. You can consider finding a nearby restaurant and café to get some snacks or meals too. Most of the restaurants and café will offer a nice spot to enjoy the perfect Mount Bromo’s view as well. It must be such amazing adventure to do, isn’t it? If you think that the dramatic Bromo’s Sea of Sand is calling for your presence, it will be perfect to find the best Bromo tour provider first. Here, www.jogjabromotour.com is highly recommended ones. It offers tour sunrise Penanjakan Bromo as well as other exciting Bromo tours that won’t disappoint you. So, what are you waiting for?